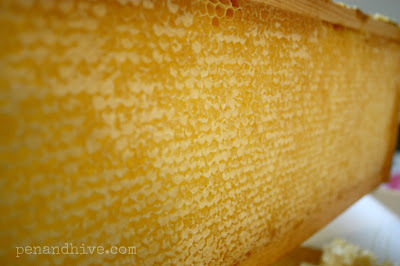 The spring and early summer honey flow ended weeks ago. 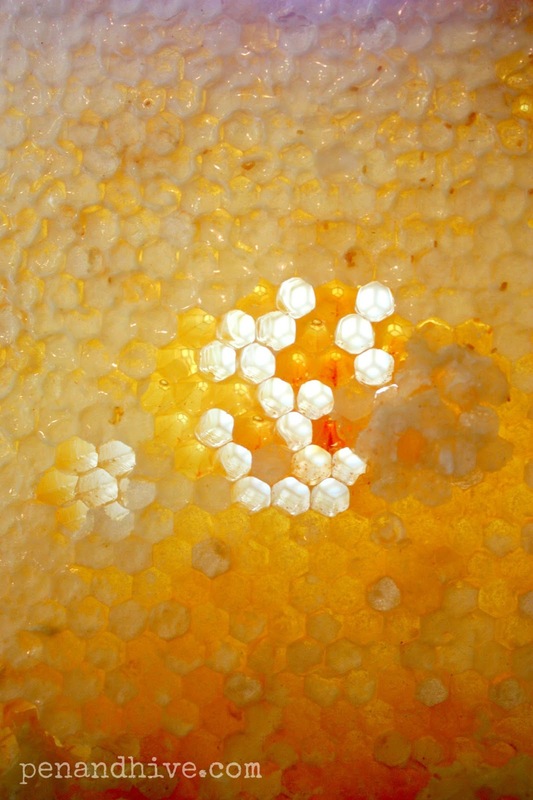 We are in the end of the fall honey flow now. I harvested the spring/summer honey without an extractor. This post covers how to do it. First, let me tell you something very important about this method-- you are going to set your bees back for the next honey flow. Why? Because if we sling the honey using an extractor we can put the frames with all the comb built out right back in the hive and the girls can start filling them up with honey. 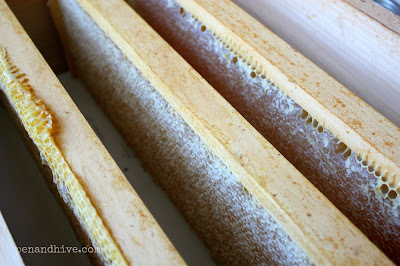 But when you scrape all the comb off or use the cut comb method they have to start over. From scratch. They must rebuild all the comb before they can fill the cells. I'm learning this lesson the hard way right now. I should have slung the honey in summer and scraped it in the fall if I wanted to. 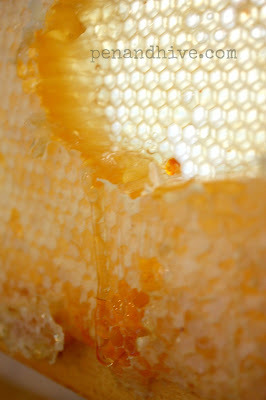 Next year I'll go back to using the extractor. 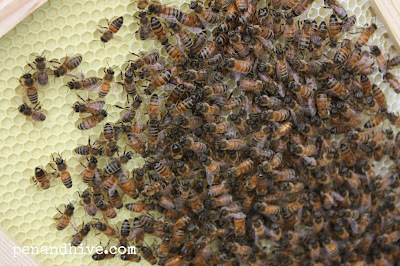 The bees start with empty frames. I use plastic foundation coated with wax. As the season goes on they build out the comb and fill it with honey. Then when the water content is around 18% they cap it off. When all the frames are capped you are ready for harvesting. 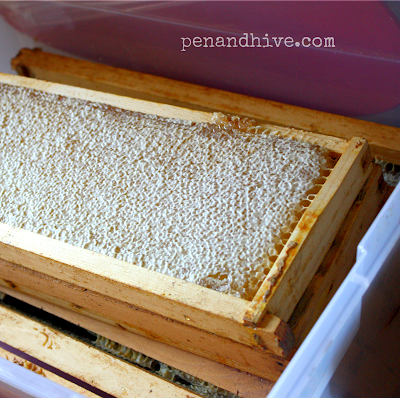 Using an extractor means scraping off the wax cappings and placing the frames in an extractor. 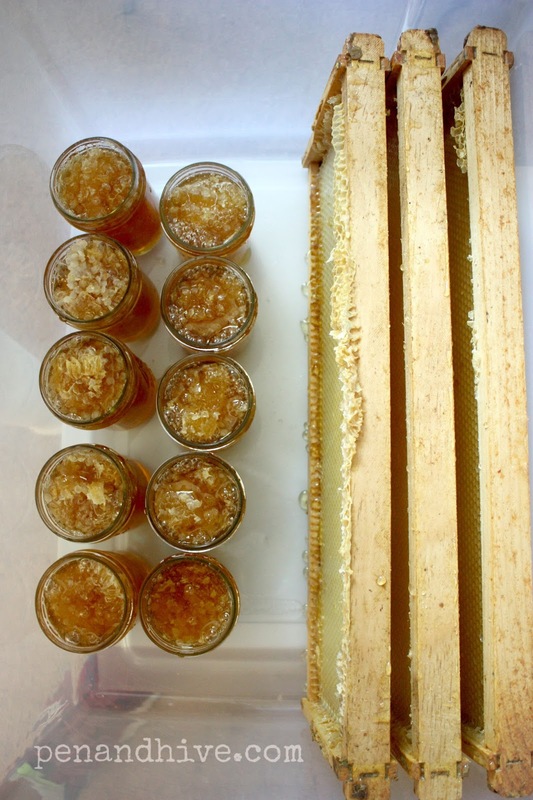 It is about the same amount of work for the beekeeper either way, but scraping the entire comb off into a jar makes more work for the bees. To read how to harvest using an extractor read this. 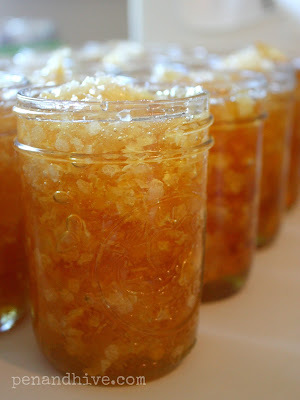 You just take a tool of your choosing (I use a metal spatula) and scrape the honey comb off into a container. 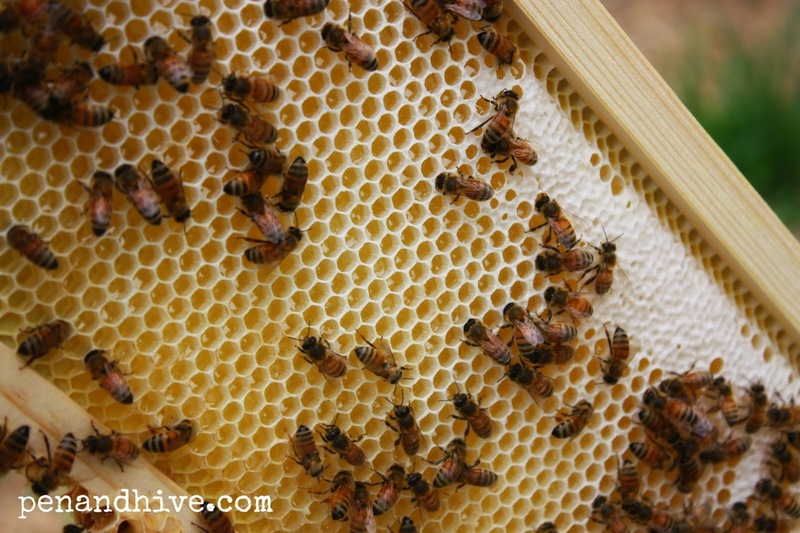 If you want to filter it you can just add a filter to catch the comb. 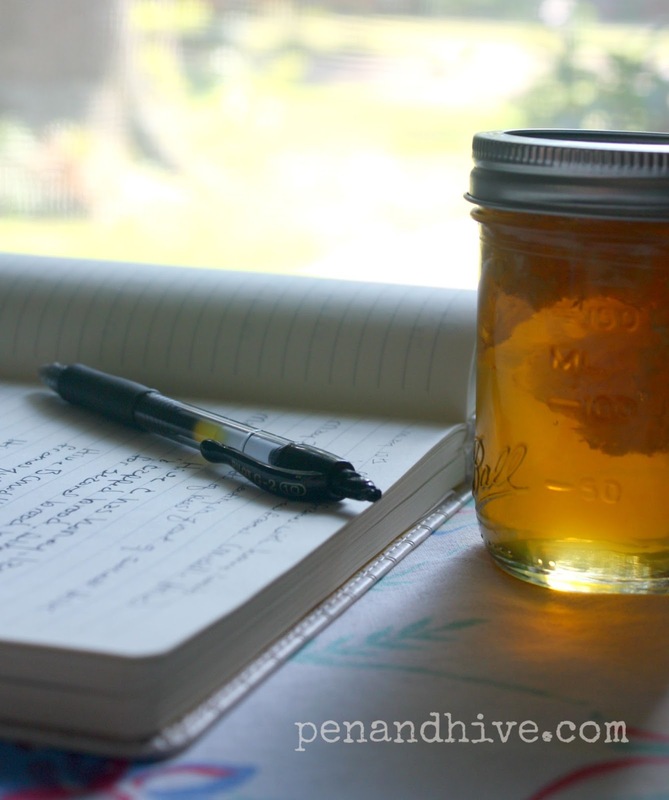 For this honey harvest I put large pieces of comb in the jar and then ladled honey in to fill the jar the rest of the way up. Here are some of my favorite pics from the process. Want more pretty pictures? Follow me on Instagram HERE. You might have already guessed but I get pretty sticky during the process. I have the best job ever. Well, the sweetest anyway. 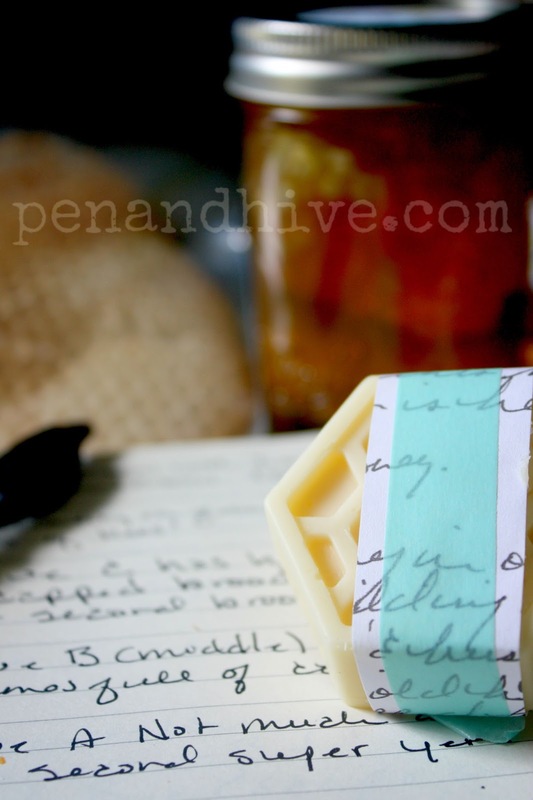 Thank you so much Michelle, for sharing this great article. 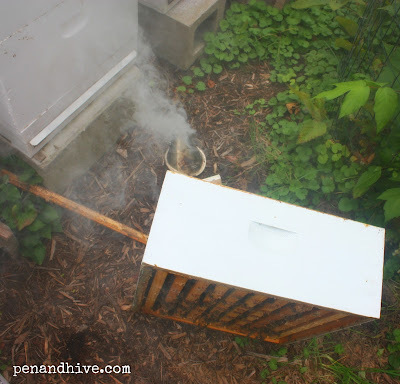 Currently, I am using homemade honey extractor for extracting honey. What can I do in future? Can you help me selecting the best extractor. Hey Joseph, I have the Dadant Jr. Bench extractor which is at the low end of the price range and works just fine. I prefer the crank handle to an electric one because it's easier for me to control. Honestly, all the extractors I've seen look pretty much the same and I haven't heard any beekeepers saying there is one particular one that just isn't any good. It's probably a safe bet that if you buy the one that seems like a good fit for your needs and budget it will work just fine for you. Thanks for reading!